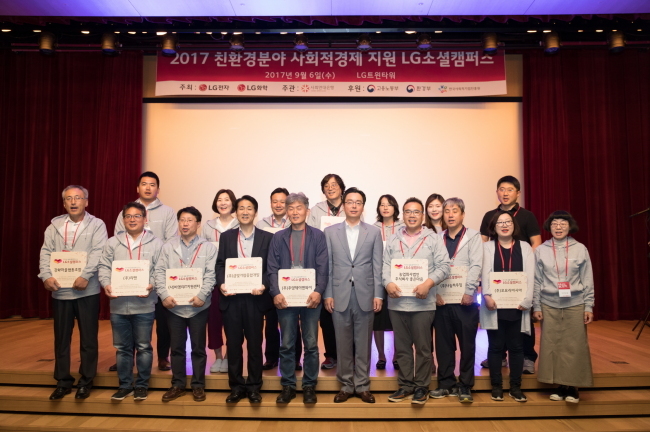 LG Chem, the chemicals and biopharma business unit of South Korea’s LG Group, is carrying out corporate social responsibility activities under its slogan of being a “solution partner” to provide solutions for social minorities and entrepreneurs, the company said Tuesday. Together with LG Electronics the company runs LG Social Campus, helping social enterprises by providing loans without interest, renting out workspace and educating workers. It has provided funds of some 13 billion won ($11.4 million) to 110 companies in the past six years, the company said. “We plan to carry out more programs related to the environment and energy alongside teenage education. Through CSR activities, LG Chem will do its duty as a responsible company, and grow together with the society,” the company said. LG Chem also supports a number of schools and welfare facilities near its office. Since 2005, the company has run some 60 rounds of chemistry camps across the country for over 7,000 middle school students, it said. It invited some 400 middle school students this January across four camps, each held for three days, for participants to experience the value of chemistry. LG Chem’s CSR activities as a leading chemical company have included preserving the ecosystem since 2017. The company launched a volunteer group named “Green Maker” consisting of roughly 200 employees and executives last year to eradicate invasive plants for a cleaner environment.